When your garage is due for an upgrade, look no further than Custom Garage Works! We have been offering a selection of custom garage services such as garage floor coating in Little Elm, TX since we originally started in 2003. We set out to create the perfect garage for ourselves and our growing families, but when we could not find what we were searching for within the current industry, we made the decision to jump in ourselves. Now, we proudly offer professional garage storage solutions, along with top-of-the-line polyurea polyaspartic floor coatings, that have a significantly longer lifespan than epoxy. Our team is professional trained, and we are passionate about designing custom garages, with impressive garage floor coating results across DFW. 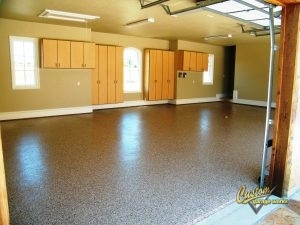 One of our most popular garage services is our garage floor coating in Little Elm, TX. This coating is so popular because it is both more resilient, and cures faster than traditional epoxy. While with epoxy floor coatings, you have to avoid UV exposure and watch out for flaking, our polyurea-based floor coatings are significantly more durable. And thanks to our use of a diamond grinder instead of risky acid etching for floor preparation, we can ensure a greater amount of adhesion, which leads to a better installation. Give us a call at 214-494-9068 or 817-308-1305 for your free estimate today, and we can tell you more about our professional garage floor coating service. And More! 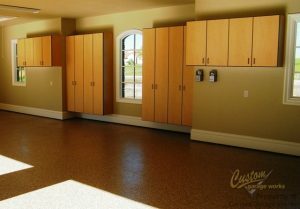 If you are interested in other garage floor options, click here to see our other services! When you are running out of space in your garage, Custom Garage Works has the right garage storage and organization solution for you! We know that a brand new garage floor looks best when it won’t be covered by other items in your garage. With options such as garage cabinets and overhead storage racks, we have a variety of solutions for our clients’ garage organization requirements. All of our Bulldog cabinets are secured to the wall for additional safety, and our overhead storage racks are stronger and more dependable than the others you’ll find on the market. We are dedicated to helping our clients obtain the perfect garage floor coating and organization for their needs and budget, and we look forward to serving you! Overhead Storage Racks If you need to get the most out of your overhead storage space, our reliable storage racks are a fantastic place to start! Car Lifts Our car lifts let you store your cars with style and accessibility, and they won’t scar your garage floors! And More! Our organization services are affordable and efficient ways to improve the aesthetic and feel of your garage.